Even if you don’t have a back yard, you can still transform your patio into a fun outdoor place to relax and it won’t cost the earth. This patio is filled with recycled items. The old table and chair have been given a new lease of life together with the table made from recycled pallet wood. You can even leave room for growing vegetables and with the overhanging plants you will have an abundance of food. 16 Amazing Budget DIY Garden Ideas. Great idea to brighten up a dull corner is to add some flowers. This recycled bathtub has been turned into a new home for some beautiful plants. 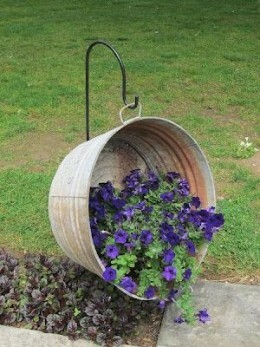 With a little imagination you can transform any part of the garden easily with some old containers and a few plants. You could try filling it with evergreen shrubs so that you have a cheerful yard all year. You could paint the tub with a coat or two of paint to really make an impact. When you have something to celebrate or are entertaining in the garden lighting is a great idea and can be done very easily. 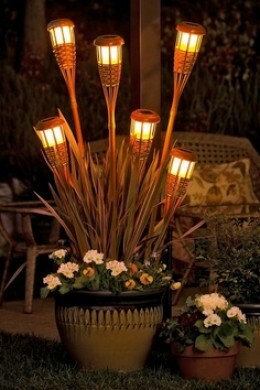 Tiki torch lights are very effective and set in a container with flowers bring the garden to life. Tiki torches can be made very easily from wick bought from hardware stores. They are great fun when you are having BBQ’s or garden parties. Using old bricks to put tee lights on around the garden or hanging lanterns in trees are some of the ideas you can use to create a party atmosphere. 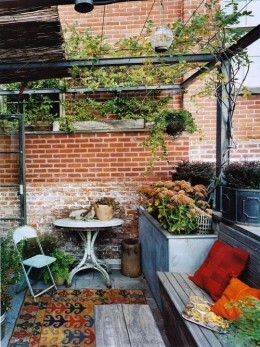 With container plants it is easy to do your “gardening” while sitting in comfort on the patio. Almost any kind of plant, flower or vegetable will grow happily in containers and the foliage will look awesome. The great advantage of this kind of gardening is there is less digging and bending and children can have their own special containers in which they can grow their own favourite plants. You can also change the position of the plants to ensure that they are all getting enough sunlight or too much sun. Old wine crates are a great idea for growing herbs and salads and make a fabulous display on the patio or in the garden. Keep them as close to the house as possible as kitchen gardens are used almost every day. Put trailing herbs such as thyme and trailing rosemary around the edges of the container, followed by the upright herbs such as basil, parsley, tarragon, oregano, chives, and coriander. Take care not put in too many herbs as they spread and grow quickly.